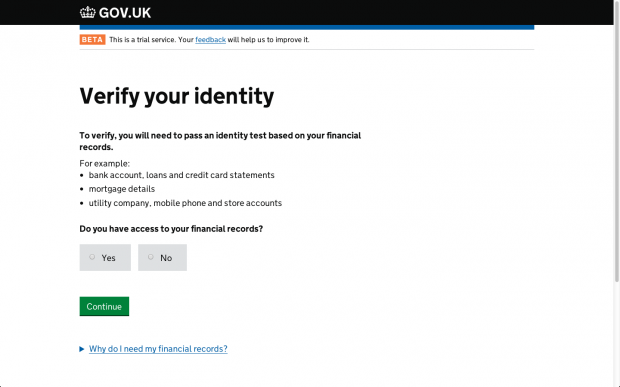 We’ve been developing GOV.UK Verify over more than 18 months of user research and iteration. Since we launched the public beta of GOV.UK Verify, we’ve been gathering feedback from the first people to use it. We’re using that feedback to continuously improve GOV.UK Verify and make it as straightforward as possible for people to use. Understanding what works and what doesn’t work helps us to understand what we need to do to continue to make GOV.UK Verify better for everybody. One of the first things we’ve found is that some people aren’t able to answer the questions used to verify their identity without referring to their financial records. These questions are necessary to make sure that it’s you being verified, and someone isn’t pretending to be you. To help make sure that people will be able to answer these questions, we’ve added a page to ask if they have access to this information, and to explain what they can do if they don’t. We’ve been testing this new page in our user research lab. It helps, but we know it isn’t perfect just yet. Some people look at this page and don’t read either the page heading or the first part of the page, and so don’t understand why they may need to refer to their financial records. We’re looking at ways of improving this and will be making updates in the coming weeks. We’re looking forward to getting more feedback. We'll continue to improve GOV.UK Verify based on what we learn. Why do we need driving licence as well as passport info. Some people do not have a driving licence particularly those applying for transfer of part of tax allowance for married partner over 65. Hello Sylvia, thanks for your comment. The certified companies have to validate a range of evidence to establish that it's really you - no single piece of evidence is sufficient. That's to protect against someone having stolen a document and being able to use it to pretend to be you. In some cases, it is possible for a certified company to verify your identity using either a passport or driving licence in combination with some other validated evidence (such as a loan, mortgage or bank account). If they are not able to do that, they may have to ask you for both documents. Over time we plan for the range of evidence you can use, and the range of methods companies can use to validate it, to increase, so you won't need both of these documents. We've explained some of this in other posts on the blog and will carry on posting updates. I want an active website to use to apply for identity verification . I can't find one . Why is it so difficult ? I would have thought the Government has enough data on all of us not to need a series of private profiteers to verify who we are. Thanks for your comment. Although different parts of government may hold information about you, they do not hold the range of information necessary to establish that you are who you say you are on the balance of probabilities. Certified companies have the means to look at a wider range of information to establish this. Additionally, working with certified companies means government does not need to store everyone’s information in one place - this means your information is safer. This does not affect me personally but the range of questions and information you appear to use to verify identity will not be available for a portion of the U.K. population. How do you intend to verify the identity of those who do not have prime naming on household bills, don't have bank accounts, credit cards, store cards and live at the edge of our society? We are aware that lack of credit data can be an obstacle to verifying and as a result we are developing new ways of verifying identities to alleviate this issue. 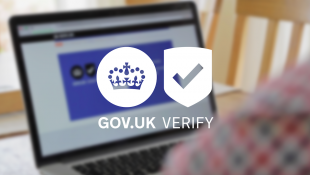 Our aim is that 90% of people who are expected to use GOV.UK Verify will be able to do so by the end of 2016. However, there will always be people who will be unable to verify for a variety of reasons, such as those you have outlined. Nobody is excluded from a service if they can’t be verified by GOV.UK Verify. Other channels will be available for people who are not able to use digital services, including if they are not able to verify their identity entirely digitally.